Now that the bye weeks are in full swing, waiver wire pickups become that much more important. As I always say, championships are won on the waiver wire, not in the draft. First off, my apologies go out to anyone who started Keith Brooking based off of my "Lock of the Week" recommendation. He was absolutely atrocious as he failed to register even one stinkin' tackle. In my defense, Brooking missed multiple tackles and had two separate chances for an interception, but due to his hands of stone, he wasn't able to bring the ball in successfully. Also, the Titans came out throwing the ball much more than expected which led to less tackle opportunities for the Dallas linebackers. Even with this being said, I'm still going to have a hard time recommending this pumpkin pie, haircutted freak in the future. Osi Umenyiora continues to play well despite battling injuries as he had 2 more sacks last week making that 5 total sacks in his last two games. 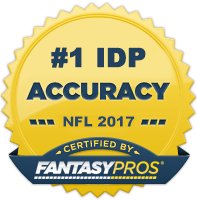 He's quickly becoming a high DL2 in the majority of IDP leagues. Barrett Ruud just doesn't look the same this year. He's not getting off blocks well and I'm concerned that the improved play of Tampa linebackers Geno Hayes and Quincy Black is going to continue to cut into his numbers. I'd try to unload Ruud in a trade if possible. Brian Cushing played pretty darn well in his return. The "Cush" racked up 9 total tackles (4 solos) against the Giants. It appears safe to re-insert him back into your lineups as an every week starter. Jon Beason finally broke out against the Bears in Week 5 while James Anderson fell back down to Earth a bit. I expect this trend to continue as the season progresses. I would buy low on Beason and sell high on Anderson. Eric Weddle continued his string of mediocrity last week as he only managed 3 solo tackles and 1 assist against a pretty good matchup in the Raiders. I'm personally done starting Weddle in all of my leagues. There are way too many solid choices at the DB position to continue to start him or even have him on your bench in shallower leagues. There are a couple of safeties in Donte Whitner and Nedu Ndukwe that I recommended last week that had very good games and are on bye this coming week. Make sure that you don't forget about them heading into Week 7 as they both have mid DB2 to low DB1 potential. Whitner has more long-term value than Ndukwe as Nedu is likely to head back to the bench once Roy "Horse Collar" Williams returns from injury. 1. RDE Matt Shaughnessy (OAK) @ SF - An injury to weak side linebacker Quentin Groves has forced right defensive end Trevor Scott to slide back to linebacker. This means that Shaughnessy is no longer splitting time with Scott and should remain a three-down lineman as long as Scott continues to fill in for the injured/underperforming Groves. "Shag Nasty" had 6 total tackles and a sack last week against the Chargers offensive line increasing his sack totals to 3 on the season. He projects as a DL3 with DL2 upside. 2. LDE Isreal Idonije (CHI) vs. SEA - The somewhat surprising release of Mark Anderson gives Idonije the opportunity to have a more expanded role at the left defensive end position. In his first game in a full-time role, he put an impressive 3 sacks to go along with 7 total tackles. This makes 4 sacks in 2 games for Isreal who should continue to receive one-on-one matchups as teams focus the majority of their attention on Julius Peppers. As we all know, the defensive line position is quite thin this year in fantasy football and Idonije has a good of chance to help solidify that position for you. 3. RDE/WLB Trevor Scott (OAK) @ SF - As I mentioned above, Scott has moved to weak side linebacker in place of the injured Quentin Groves. This transfer obviously helped Scott's tackles numbers as he put up 7 total tackles which were more than he had racked up in the previous 4 games combined. Scott is still listed as a DE in most scoring systems and is a very sneaky pickup in tackle-heavy leagues. RDE Chris Clemons (SEA) @ CHI - I'm going to stick with the trend of starting defensive ends who play the Bears as Chicago has allowed a league high 21 sacks and 36 quarterback hits. Clemons has had back-to-back 2 sack games and matches up well against Chicago's porous offensive line. He's coming off a bye week and may have been dropped in your league. If so, scoop him up as he's got a good shot for a sack this week. 1. WLB Clint Session (IND) @ WASH - Session was one of my favorite undervalued IDPs heading into the season. He plays on the weak side in a cover-2 based defensive scheme and therefore has an above average amount of tackle opportunities. Session has been bothered by injuries for the entire season causing him to miss 2 1/2 games so far. He's now back to playing full-time and seems to be completely recovered. He put up 8 solo tackles and 2 assists last week against the Chiefs and should have low to mid LB2 value moving forward. I'd rather him him on my roster than Gary Brackett at this point. If Session is available on your wire, I'd grab him as he's a good long-term plug-in. 2. SLB Gerald McRath (TEN) @ JAX - I have to admit, McRath's numbers last week were a bit surprising to me. The comments made my Jeff Fisher earlier in Week 5 indicated that McRath would be brought back slowly. However, McRath was in for a majority of the team's snaps and put up a 7-1-0 stat line in his first game back from a four game suspension. McRath makes for a great dynasty league pickup and a good flex play in deeper leagues. 3. SLB Stephen Nicholas (ATL) @ PHI - Rookie Sean Weatherspoon left last week's game in the 3rd quarter after re-injuring his ankle and was seen wearing a knee brace after the game. If "Spoon" can't go against the Eagles in Week 6, Nicholas will likely fill in. The Eagles aren't a great matchup, but "Saint" Nicholas had 12 solo tackles in Week 4 against the 49ers when he last filled in for Weatherspoon and is a good option in deeper leagues. 4. WILB Kevin Burnett @ StL - There is value to be had within the Chargers inside linebacking crew. However, due to injuries/heavy rotations of different players, there hasn't been much consistency from any of the inside backers; except for Burnett. He's managed 5 or more solos in each of his first 5 games and now has had back-to-back multiple sack games. He has a nice matchup this week against the Rams and I wouldn't be afraid to use him as a low LB2, high LB3 if you need to sub someone as a bye week filler. WILB Desmond Bishop (GB) vs. MIA - People who follow the Packers closely were aware of Bishop's potential and were interested to see how he would perform in place of the injured Nick Barnett. Bishop made the most of his new role as the starting weak inside linebacker by posting 11 total tackles and a sack. This is impressive considering the Redskins entered the week allowing the 5th least fantasy points to opposing linebackers. With Nick Barnett likely done for the season with a wrist injury, Bishop becomes a must grab linebacker in deeper leagues (and in shallower leagues if you need help at the position) as he has LB2+ upside. He's got a great matchup this week against the run-heavy Dolphins and figures to be a great start. This could shape up to be a similar situation to what we saw with David Hawthorne last season. 1. RCB Kyle Wilson (NYJ) @ DEN - This pickup is solely depends on if Darrelle Revis plays against the Broncos in Week 6 or not. Assuming Revis does NOT play, Wilson is in for a big day as the Broncos have completely abandoned their running game and have instead choose to attack their opponents through the air. Kyle Orton is currently averaging over 42 pass attempts per game and the Broncos are consequently giving up the most fantasy points to opposing cornerbacks. You can bet that Orton will be looking Wilson's way often as he has struggled as of late. 2. FS Cody Grimm (TB) vs. NO - Grimm was forced into the starting lineup after Tanard Jackson's season-ending suspension in Week 3. In the two games he has started, Grimm has put up a solid 13 solo tackles and 5 assists as well as a pick-six. This position has been a fairly productive one in fantasy terms and with the New Orleans Saints next on the schedule, Grimm figures to be a solid play again this week. 3. FS Troy Nolan (HOU) vs. KC - Nolan, a 7th rounder out of Arizona, has come out of nowhere to become a solid playmaker in the Texans secondary. In his first two games as a starter, he has put up 12 total tackles and 2 interceptions. He's still likely to split some snaps with Eugene Wilson, but Nolan is still worth picking up in those deep, dynasty leagues. 4. RCB Patrick Robinson (NO) @ TB - Filling in for the injured Tracy Porter, rookie Patrick Robinson racked up 8 solo tackles against the Cardinals as they made a point to attack his side of the field. Porter is out at least a couple of more weeks and Robinson should continue to see a good amount of balls thrown his way as teams try to avoid throwing to Jabari Greer. The "rookie corner" rule should be in full-effect here. FS Michael Huff (OAK) @ SF - Huff is finally starting to live up to some of the hype he generated when he was drafted with the 7th overall pick in the 2006 draft. He currently leads all Raiders with 29 solo tackles and has increased his tackle numbers every week since the start of the season. He has a great matchup against the 49ers this week as they are currently allowing the 5th most fantasy points to opposing safeties and as long as Rolando McClain continues to struggle, Huff should see above-average tackle opportunities.